Hey there internet-land, I’m Rob (bio in the ‘about me’ section) and I’m the new guy here at Comic Impact reporting from Leeds, England! I figured I’d best give you a little introductory post before I throw myself in off the deep end and start writing articles, just to get you caught up on what I’m going to be doing here. I’m going to have a little slot every Thursday called Tea Time Thursday, where I will talk about one British comic that caught my eye! The feature will start this week because I’ve got myself a British comic I can’t wait to blab about! My feature will provide some insight into the world of British indie comics, as I like to think the aim of it is to get you people interested in British books, opening your eyes to all the great UK comics that are being published. I’ll be covering a wide range of work, anything from the more popular 2000 A.D., to something my next door neighbor might have made in his bedroom about his woeful life stories! Let’s have ourselves an adventure here and see what cool comics we can discover! Wow.. that sounded somewhat camp. But you get the picture. Not to mention from time to time I’ll be looking to do some interviews with writers and artists at UK conventions or wherever! Now I won’t always be talking about PURELY British comics, oh no sir! I will be doing the occasional post on the vast amount of good ol’ American comics that I read each week (because I love Marvel, DC, etc.- they’re my first love), if there is something I want to pinpoint in an issue I read, or a topic that needs to be discussed! First and foremost though, I will be here for my new Tea Time Thursday slot. I’m excited and can’t wait to get this underway, so stay tuned. 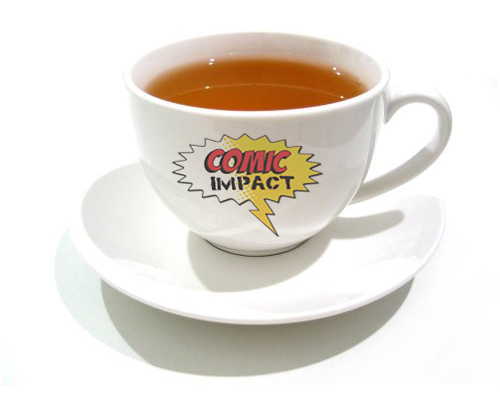 See you soon ComicImpact readers!